In Incidents in the Night David B. sets out to explore the uncharted territories of overflowing and dusty shelves of Paris' legendary book shops. 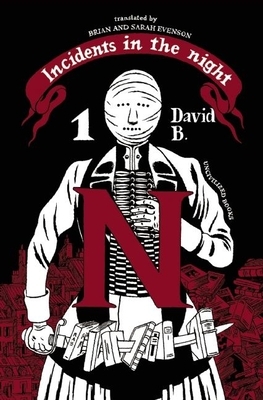 His journey quickly turns into an obsessive vision quest in pursuit of a mysterious nineteenth-century journal: Incidents In the Night. Mountains of books become sites of archeological digs as the author excavates layers of myth, fact and fiction in search of the elusive thread that links them all. Along the way he stumbles on fanatical Bonapartists, occult conspiracies and the angel of death. Incidents in the Night is an intricate, ever-expanding web of dream and reality exquisitely translated by Brian Evenson. David B. is one of France's finest cartoonists and one of the co-founders of the legendary L'Association collective. He is the author a many books: The Armed Garden and Noctural Conspiracies, among many others. Epileptic was was awarded Angoul me International Comics Festival Prize for Scenario and the Ignatz Award for Outstanding Artist. Brian Evenson is the author of ten books of fiction. He is the winner of the International Horror Guild Award, and the American Library Association's award for Best Horror Novel. He has translated work by Christian Gailly, Jean Fr mon, Claro, Jacques Jouet, Eric Chevillard, Antoine Volodine, and others. He is the recipient of three O. Henry Prizes as well as an NEA fellowship. He lives and works in Providence, Rhode Island.